The CSP project will total 700 megawatts (MW) and is the first actual CSP project that will deliver electricity at a price well below $100/MWh. The Spanish CSP plants were built with a FIT of about $350/MWh, the most recent ones in the USA, Morocco and South Africa at costs of about $150/MWh. The DNI in Dubaï, not being better than in Spain, does not explain the difference, and the low cost of land only plays a very marginal role. The competitive pressure of auctions is not in itself a cost-reducing factor – at best it reveals the true costs of bidders. Good financing conditions (4.75% interest) is of course an important element, but it’s fully commercial, there is neither concessional fund nor sovereign fund guarantee. The low price thus seems to be mostly due to the reputation of the off-taker, of the technology and of the developer. And, of course, thechnology Learning and scale effects. Initially, DEWA ran an auction for 200 MW tower. The winner, ACWA and Shanghaï electric, offered $95/MWh. 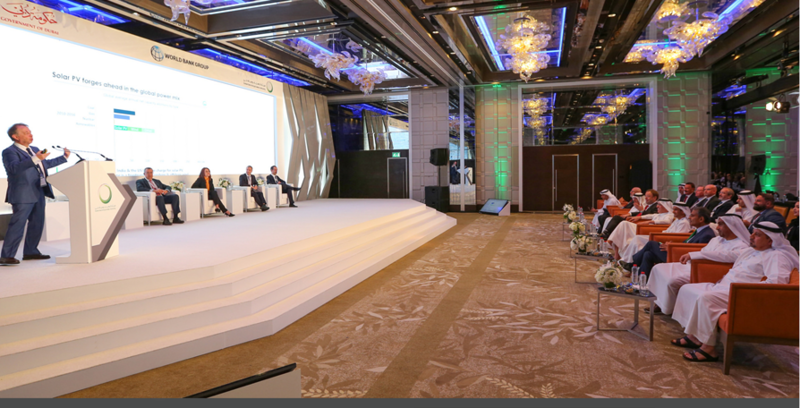 Further discussion between DEWA and the winner convinced DEWA, in need of new capacity, that a larger programme would offer a lower cost – a cost fully competitive with new CCGT. The final deal was for 700 MW at $73/MWh, to be delivered from 4 pm to 10 am. Most likely, power will also be delivered from 10 am to 4 pm but paid the same as PV, i.e. $29.9/MWh (ppa level of 800 MW PV third phase of the Solar Park currently under construction). The capacity of tower was however reduced to 100 MW, taking the ground-level atmospheric conditions in account, while the rest will be parabolic troughs in three plants, 200 MW each. Financial close is… close, due to this month, first electricity is expected at end 2020. Even lower prices have recently been quoted in Australia ($65/MWh) and Chile ($48/MWh). However the details of payment in Australia are complex and the LCOE value of the 150 MW tower in development at Port Augusta might be significantly higher. The the CSP bid at $48/MWh in Chile was unsuccessful, well above the successful energy-only PV + wind bid at $31/MWh – it’s not clear if the bidder, SolarReserve, would have made the same offer if it had had any chance of success. Paddy Padmanathan, the CEO of Acwapower,said that in better solar conditions the Dubaï project would deliver at ~$55/MWh – a level that he expects to be reached in conditions similar to Dubaï’s in a few years’ time, equivalent to some ~$43/MWh in better conditions. Opening the supply chain and increased competition would be key for further cost reductions, he said, while outside China there are only two mirror manufacturers for troughs, only two HTF receiver manufacturers, and only one supplier of salts for thermal storage. Another achievement than Dubaï’s would be needed to prove the new (relative) competitiveness of CSP. It may come from the expected bid for Midelt, the next Morocco’s plant after the three Noor plants, although Midelt’s bid levels will be “polluted” by its hybridisation with PV, or Saudi Arabia, which is said to be close to launch a 1 GW CSP auction. Still, after onshore Wind power and solar PV achieve deep cost réductions (we have not seen the end of this, though), now it is CSP and offshore Wind that show deep cost réductions. The deal in Dubaï was made at half the cost of the previous generation. Recent auctions for offshore wind ended up with strike prices very close to that of CSP in Dubaï, in the 70 euros. Both technologies seem ready to offer a vast array of new possibilities to add to those offerred by onshore and PV. In particular, thanks to its built-in thermal storage CSP can offer electricity when the sun sets but the demand peaks – when power has its maximum value. You can see this on the graph above, which represents a mock power mix of a sunny country during a day, in the coming decade till 2030, with mid-merit technology (blue), baseload (purple), PV (yellow) and CSP (orange). 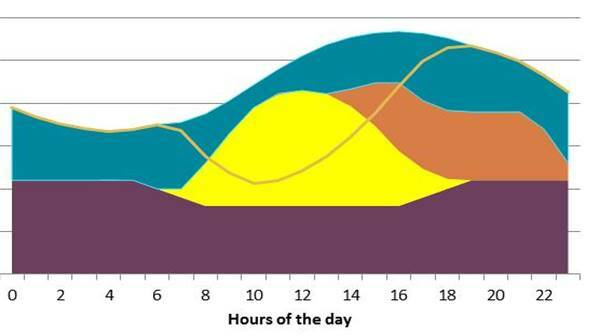 Alternatively, CSP can provide electricity all night, well beyond the peak, to achieve full decarbonisation of power, which is shown on the graph below. Note that in Dubai, the new CSP plant, when achieved, will already provide electricity almost round the clock – which the solar park, with both its PV and CSP technologies, will do very efficiently. Article très intéressant merci pour toutes ces informations.